These cartoons were published on September 8, 11 and 12 1906 in the LA Examiner. Herriman here is pretty much beating the same drum every day, likening candidate Gillett to a mule at the beck and call of the Southern Pacific Railroad. Since I haven't much commentary on these 'toons, I'll take this Saturday morn to mention Herriman's art style. Previous to 1906 Garge's artwork was far, far rougher than the polished stuff you see here (here's an example). Based on the style, and his known friendship with Tad Dorgan, I think I can safely say that Tad took Herriman under his wing and gave him some pretty intensive art lessons. In fact, if we look at Tad's work of this time next to Herriman's they're hard to tell apart. To compare, check out the June 20 post on Eddie Campbell's blog. Ha! 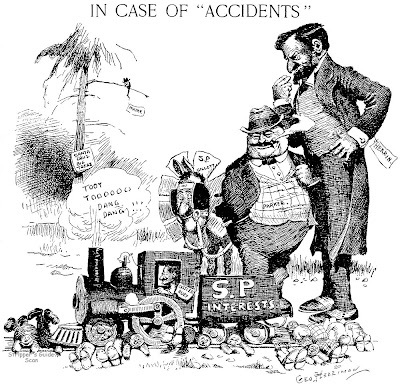 Bet that you hoped not to hear from me, as this week’s cartoons don’t need particolar comments, being – as Allan said – just variation on the theme of “the Machine” and Southern Pacific Railways. But here I am notwithstanding: as I told in my last comment, I find every excuse to do the day after tomorrow what I should have done yesterday. As you probably know, the Herriman “Examiner” cartoons are just the follow-up of a very irregularly-scheduled series he did for Harrison Gray Otis’ “Los Angeles Times” (see “Herriman in LA” in Eclipse’s “Komplete Krazy Kat Komiks” vol. 5 and 6). His first cartoon was published there on 1906 JAN 8; the last one on 1906 AUG 13 (Allan -- I sent you some scan, so, if you want, you can put them in the blog). Less than a week later, on 1906 AUG 18, the series begun again in Hearst’s “LA Examiner”. 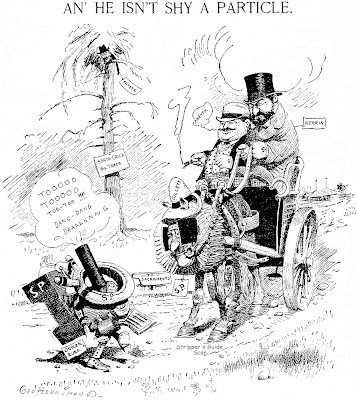 Herriman had already worked for Hearst two years before, as a sport cartoonist for the “NY American” (1904 APR 24 – 1905 JUN 2), while simultaneusly drawing for Frank A. Munsey’s short-lived avatar of the “NY Daily News”. 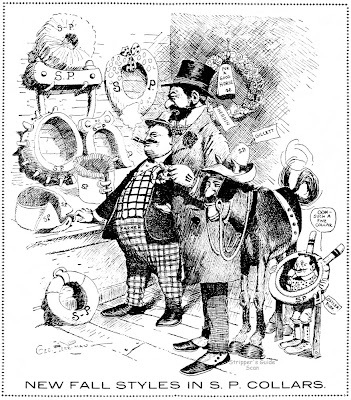 The “LA Times” was then strongly Republican (now it is Democratic-liberal); so, when Herriman passed to the Democratic “Examiner”, he had to change some of the targets of his political cartoons (in the first LAT cartoon one of the victims was Hearst himself). I wonder – and this is the question I pose to this blog - if he did this just for money or for ideological reasons. 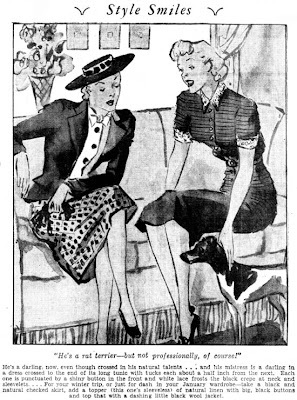 In the 20s and 30s there were several features that tried to combine the comic strip (or in this case, panel cartoon) form with fashion advice. None did very well, and Style Smiles is the least successful of the ones I've been able to track down. It was an offering of Esquire Features and started running sometime in 1937. The fashion illustrator/cartoonist on the feature was Gretchen Philips. She dropped out in 1939 and the feature was taken over by someone named Dotti*. I'm afraid I know nothing about either of the creators. The feature ended sometime in the early 40's, probably 1942 or '43. *EDIT 12/7/17: Dotti's daughter has contacted me and tells me her mother's name is Dorothy Smythe Swanson. Omaha—Much has been writ­ten about the value of consistency in advertising but for proof of the worth of repetition P. F. Petersen Baking Co., of Omaha rang up tangible evidence the other day. On Jan. 24 the bakery made its one-thousandth insertion in the Omaha World Herald of a consis­tent cartoon campaign featuring "Freshie" in its regular 2-column, 5-inch size. Placed by the bakery's adver­tising agency. Allen & Reynolds, the one-thousandth insertion was noteworthy enough to be written up in the news pages of the local daily. 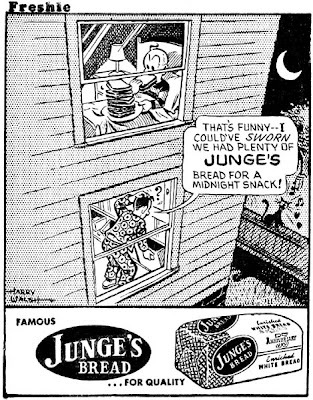 Freshie has been selling bread on the cartoon pages of the paper three times weekly since 1944. The campaign has proven so ef­fective that it branched out into a national bakery advertising serv­ice which required the agency to set up a separate department to service .the more than 50 bakery accounts which now use the cam­paign. Proof of the power of Freshie was uncovered a year ago when an impartial survey was conducted among the school children of Omaha. Using the comic pages of the Omaha World Herald, the children were asked to indicate those comics they read regularly, occasionally or never read. Re­sults of the survey showed that Freshie, appearing only three times a week, ranked fifth among all comics. Freshie has also been adapted to other media. His latest adaptation is in television with a series of five 20-second spot announce­ments executed in full animation. This series is currently appearing in nine television markets with other bakeries planning to schedule the series soon. Ethel Hays' last hurrah at NEA was Marianne, which she created in or a bit before February 1936. It was an oddball item. It was a weekly and sometimes ran in NEA's Everyweek Sunday magazine supplement or on a Sunday women's page. 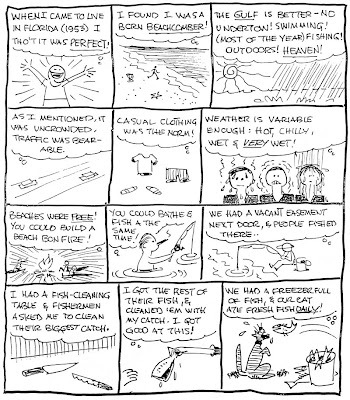 The strip was formatted like a daily, but oversized, usually running at 7 columns wide or a full page width. While the art was vintage Hays, the gags were strictly jokebook material. You could tell her heart was no longer in it. Hays last produced the feature on December 26 1937, and it was later revived by Virginia Krausmann starting around July 1938 and running until sometime in 1939. Dates on this feature are really hard to track down since it tended to jump around in the Sunday papers. For much more on the career of Ethel Hays I refer you to my article about her in Hogan's Alley issue 13. Eric Ericson burlesques the Tarzan theme in "Jasper", George Matthew Adams Service comic. The scrawny, bespectacled hero was brought up by apes, was taught English by a parrot, gets his morning shower in the form of a spray from an elephant's trunk. He is frustrated in a desire to swing from tree to tree. And wild animals generally feel sorry for him. Mr. Ericson has sold a number of animal gags to magazines, a market he has reached for 16 years. Some of the takers he lists: New Yorker, Saturday Evening Post, Collier's, Esquire. He thought up nonsensical inven­tions for the late Col. Stoopnagle such as an upsidedown lighthouse for submarines and a fly swatter for sportsmen (the latter had a hole in it to give flies a sporting chance.) He has also been gag-man for Olsen and Johnson, is currently planning a TV show which will parody travelogues. He promises some zany trappings for the strip including lightning bugs that drink fermented fruit juice to get a glow; an owl that utters such profundities as "Two heads are better than one - when you work in a sideshow." 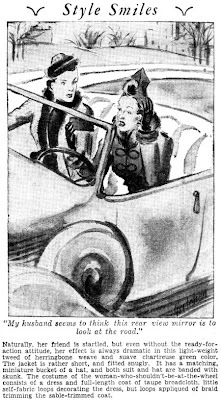 Philadelphia—Use of a car­toon for editorial expression was inaugurated by the Bulletin when a new city charter was prepared for submission to the voters. Two and a half months inter­vene between the announcement of the charter and a special elec­tion. The Bulletin desired to an­alyze salient features of the new charter and acquaint the people with them at the same time it was urging support of the charter in the election. It was felt that a daily edi­torial would soon become mon­otonous, especially if continued for two and a half months; also that the issue would be better dramatized in pictures that would show how the charter affected an average family. To that end, the strip, "The Philbys and the Charter," was de­vised. It presents a continued story, with editorial comment in the balloons, and runs at the low­er left of the editorial page across the equivalent of five columns. The first strip appeared on the day the charter text was an­nounced and will continue week­days until the special election is held. The Philbys are a young couple with two children, the father in­terested in civic affairs and the wife and children curious about how the charter will affect them. The idea for the strip originated with George T. Eager, assistant to the publisher. The artist doing the strip is Harry Fritz. From a sports cartoonist to a minister is the experience of the Rev. Charles B. "Chuck" Templeton. For nearly five years he did a daily sports cartoon for the Toronto Globe and Mail. It was also syndicated to 24 Canadian newspapers. 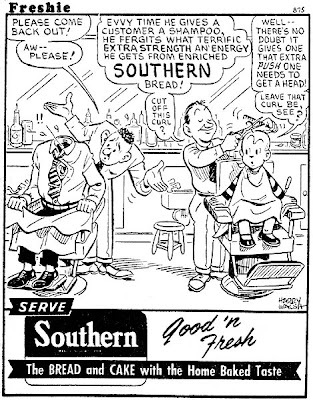 In 1936, Mr. Templeton gave up his work as a sports cartoonist to take up evangelism. At present he is studying at Princeton Theo­logical Seminary and is pastor at the Ewing Presbyterian Church, Trenton, N. J. During Lent he has been preaching at the Fifth Ave­nue Presbyterian Church in New York City. 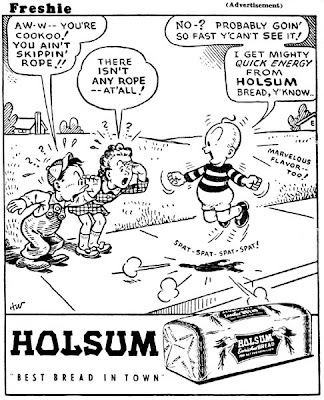 Jack Callahan was a great cartoonist whose work ran in the Hearst papers for almost thirty years; his excellent series included Freddie the Sheik, Clarabelle's Cousin, Cinderella Suze, Home Sweet Home, and many others. How sad that he was reduced to placing an ad in E&P shilling for work. Here's one of those things that drives us researchers bonkers. 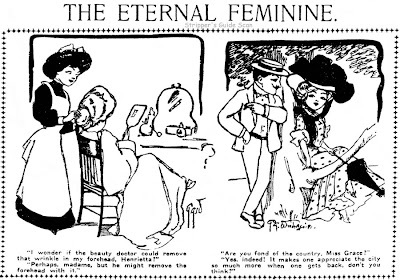 The Eternal Feminine was a Hearst feature; it ran in the New York American from December 3 1903 to July 5 1904, then switched over to the New York Evening Journal and ran there just three times in the period from January 11 to July 15 1905. So far so good. But the sample above is one I just found in the LA Examiner running in late 1906. So was the feature being produced at this late date but not running in the Hearst New York flagships, or was the Examiner just plugging a hole using old stock? Without easy access to the American and Journal microfilm there's no way to know, and if this sample isn't found in the New York run that opens up a whole can of worms, since it means the New York papers weren't running all the Hearst material even at this early date, when this researcher at least has always assumed they were reasonably dependable. I'm guessing, though, that the Examiner pulled this item from old stock since it's the only one they printed in 1906. Ah well. On to the series itself. Grace Weiderseim, better known to us as Grace Drayton, penned these panels right near the start of her long relationship with Hearst. It was her first non-Sunday series for the company. 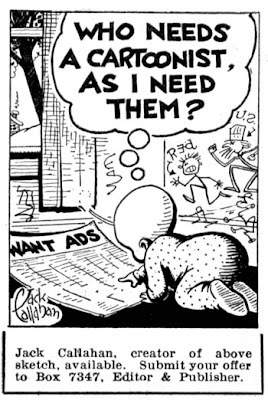 Drayton, of course, is best known outside comic strip circles for her Campbell's Soup cartoons. as you surely understood reading my suspiciously frequent comments, it is a moment in which I desperately try to find any and every excuse ** not** to do my regular job, i.e. writing my comic series “Martin Mystère”, now in its 25th year of publication. On NewspaperArchive.com - Advanced search - Exact date: 1904 January 16 + Exact phrase: Wiederseim (if you just put “Wiederseim” - “any date” you will NOT get that particular page, also if you should: mystery of that maddening site), you’ll find the sample of “The Eternal Feminine” I used in “Eccoci ancora qui” (page 227). It was published by the “Fort Wayne News”, and, at the time, I found many other ones that must be in a DVD I put somewhere (i.e. “which is lost forever”). This happened when “NewspaperArchive.com” was “NewspaperArchive.com” and not the mess of nowadays: no use searching for those pages today. This to say that “The Eternal Feminine” was widely distributed, together with many “fillers” from the “NYAmerican” and “NYEvening Journal”, an interesting and esoteric production to which I hope you’ll devote some space in your blog. I say “distributed” and not “Syndicated” in the modern sense of the word, as, confronting dates, I **suppose** that such material was sold in packets, to be published whenever there was a space to fill, often months after the original publication. I ** imagine** it was the case also for Hearst papers, such as the “LA Examiner”. Anyway, if the “LA Examiner” had published something before (or independently from) the “NYAmerican”, it wouldn’t be such a surprise. The “San Francisco Examiner”, for instance, published much material that was not in the NY paper, beginning with Swinnerton’s Bears, and it happened before 1900. I used to consider it as a given fact. End of the comment. Now I have the excuse to say that it’s too late to begin writing, and that I’m tired and I’m going to sleep. With all best wishes to the legions of Martin Mystere fans, we are awfully happy to have you taking some time off to visit and participate in Stripper's Guide. As regards the early Hearst material, I did realize that it was distributed in some manner to non-Hearst papers as well as those within the chain (and I agree that syndication isn't the proper term for it, as the distribution was undoubtedly in bulk packages with no specific running dates in mind). But for a Hearst paper to run the thing so long after its NYC running dates is ... unsettling. While indexing the NY Hearst papers I found many, many instances where a feature (and Eternal Feminine is a good example) would run only occasionally on widely separate dates. Since these features were mostly done by freelancers, it makes me think that perhaps Hearst purchased a batch of, say, 12 strips, and then ran them only when they didn't have enough material from their in-house cartoonists. This is all fine and dandy, but when we put distribution into the mix we might have all the episodes of the strip running immediately on being received in LA, whereas they get piddled out over months or even years in NY. Thus any start and end dates assigned are essentially illusory, whereas I vainly hoped that the NY dates for the Hearst material produced there could be considered more definitive than perhaps they really are. Logically, I knew that this sort of thing was probably happening, but I have very rarely seen instances like this one where a Hearst paper runs the material so far out of date. And in fact, running late is okay, but I would be disappointed, if not terribly surprised, to find NY material running elsewhere before the NY run. So far I haven't run into that situation with this early material.